Looks like we're working on similar concepts. Looks like you're making an idle adventure of some kind? I'm taking it slow and working on the design and layout of things before getting to content so that I can continue to improve existing features. Nothing really set in stone yet, if anything it's a shell. Some updates: changed the color of lights a bit (they're closer to realistic lighting being off-white rather than pure white), fixed the back arm placement relative to the weapon. It's not perfect, as the best way to do it would be via IK (I did get that working in the game too! 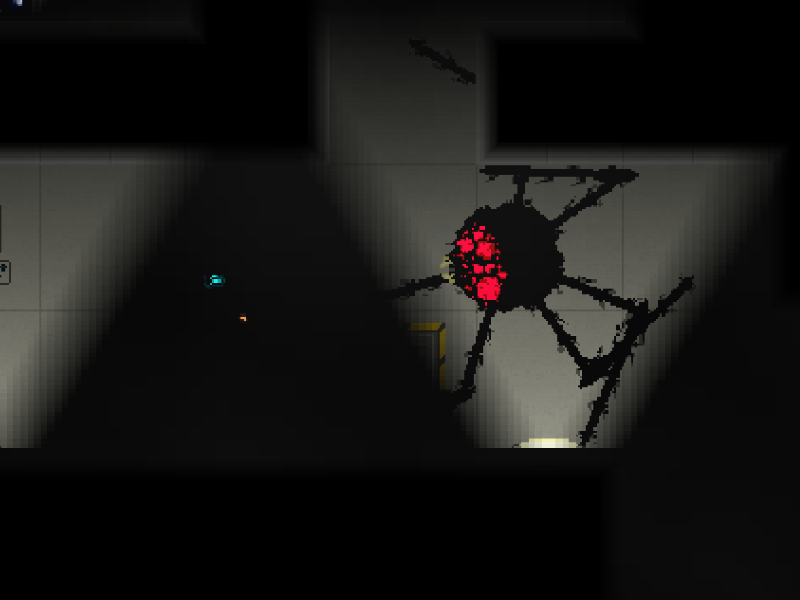 I'll be reprogramming an enemy to use it) but it didn't require me to completely rework the arms. That being said, I did completely rework the arms. It's mainly why the weapons don't currently glow in the link above, but that'll be back shortly as I turned them off solely for testing. As well, I believe I'll be adding lights to the armor in other various spots, possible as a health indicator similar to Dead Space, not 100% on that though, but definitely more lights in general. As well, I added some dynamic camera effects. The default camera scale is a bit closer in (wider than the example shows), and the camera zooms in a bit while moving and even moreso while running, tilting a bit as well. It gives a lot of life to the scene and, because I've made sure the space in the background stays as close as possible to its original size, the scene seems to get a good deal more depth to it. Some minor changes to the visuals for a few weapons were done, and the back arm now has less flat art to it. I didn't get a whole lot done recently due to Anthem and Path of Exile, but Anthem unfortunately has tons of issues right now and Synthesis league is pretty... meh, so I've jumped back into this a bit. Hopefully I'll have a good deal more to show off soon. Just a preview of what I've been messing around with lately. Love the look and feel of that first walk you do to the right. The speed feels perfect. They feels like a solider in that moment. Was curious what tile size you're using for most things like the windows. Other thing that always comes to mind when watching your demos is how dark it is. Obviously the darkness plays into the game in a big way but I find myself worried about it for lack of a better word. I may be an exception. Wondering if the darkness can be more of a pulsating blackness vs a sold black. Another idea is to go mild on the darkness except for when the player is looking at a bright light source with darkness beyond it as you would expect. Might play into some good surprises. Anyway, just ideas. Hope they help. Again, looking great. Hope you can keep it going. On a positive note, I found a new site for audio and it's waaaay better than the last one I was using, so the audio available to me in general is a much wider library so I'm happy about that. I would use it but the sounds BXFR makes just don't fit with my idea for the game I think. Added some ledge grabbing and updated the graphics for the back of the arm a bit. Also added an entirely new appearance for the torso specifically for the ledge grab. As a result of this change I've reduced the total jump height a bit and I may remove the ability to do a charged jump entirely. The video is a lot smoother. The movement feels nice and fluid. Positioning the axe was a pain, but it's nearly complete. Once finished, I'm going to have to go through each frame and notate each transformation to make the rest of the weapons a bit more plug-n-play. The project was started with Forum Account's sidescroller library with some adjustments/additions. This week we implemented a lot of changes to aesthetic of the game, including music, UI, and world design changes. Here's our new dialogue boxes. Not bad. The 'play/next' button is hard to see. May want more tint the background image in case dialogs can open over unknown things. I feel like the picture needs a frame/border but not sure. I like the font filter/styles you applied for the names. FACC's library to sync with Ter13's Rooflib. Also updated my cloudshadow library with a demo!